It's really important to get to the root of the problem instead of just trying to make your dog's breath smell better. Fortunately, your dog’s food can help combat bad breath by taking care of his teeth and gums. If you already brush your dog’s teeth, good for you! If not, it’s time to start now. ​Luckily, with the help of our four-legged experts, today we are reviewing the best dog food to cope with bad breath. 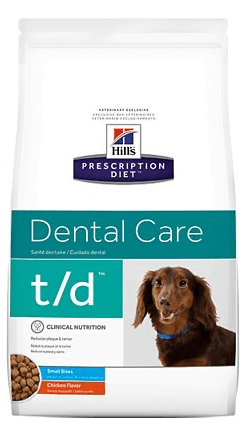 Hill’s Prescription Diet t/d/ Dental Care is my top pick for best dry dog food for bad breath. For this formula you will need a vet’s prescription, since it’s formulated differently than other dog foods to create its unique kibble. This dog food was awarded the Veterinary Oral Health Council (VOHC) Seal of Acceptance for its ability to reduce the accumulation of tarter and plaque on dog’s gums and teeth. Its kibble helps to clean your dog’s mouth with gentle abrasion. Hill’s also adds antioxidants within this formula to strengthen the immune system, which helps to fight diseases that can cause bad breath. 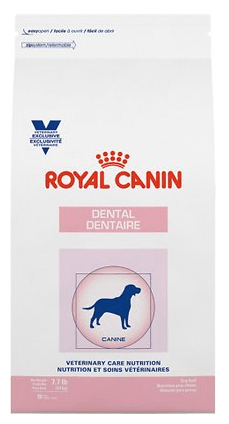 Royal Canin also offers this veterinarian-prescribed diet for dogs who need an extra boost of oral health to combat bad breath. This formula focuses on high-digestibility with its ingredients. The GI tract can sometimes be to blame for bad breath if your dog has difficult digesting his food. In addition to digestible proteins and other ingredients, Royal Canin created a uniquely-shaped and textured kibble that mirrors brushing a dog’s teeth every time he chews. The kibble will clean your dog's teeth and gums while reducing further plaque and tartar production. For added immune system health, your dog will get plenty of antioxidants, minerals, and vitamins. 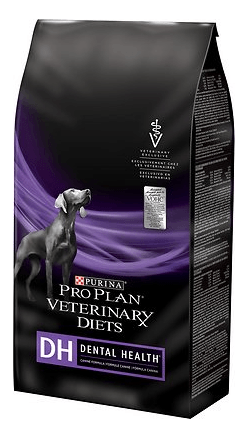 This veterinarian-prescribed diet by Purina is formulated to help clean teeth while your dog chews. Purina also has a similar variety for smaller dogs with small teeth and mouths. Purina adds in several fiber-enriched ingredients, like brewer’s rice, ground yellow corn, and ground wheat. These ingredients keep this food highly digestible, with the addition of chicken, a highly digestible protein. With plenty of vitamins and added antioxidants, this formula is excellent for supporting your dog’s immune system and combating tartar and plaque buildup. This formula by Hill’s is not one that needs a prescription, but it offers many of the same benefits as the prescription formula for dental care. Its interlocking fibers within the kibble help to clean your dog’s teeth as he chews and freshen his breath over time. Chicken, whole grain wheat, powdered cellulose, brown rice, and more, create a digestible formula. This puts your dog at less risk for stomach upset, acid reflux, and other bad breath-causing ailments. 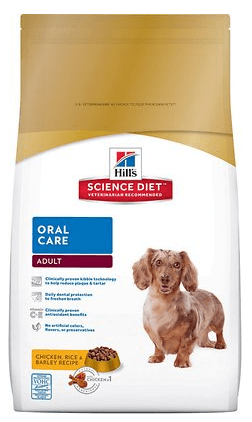 Hill’s also adds in Vitamins C and E and several antioxidants to support your dog’s immune system for overall health. 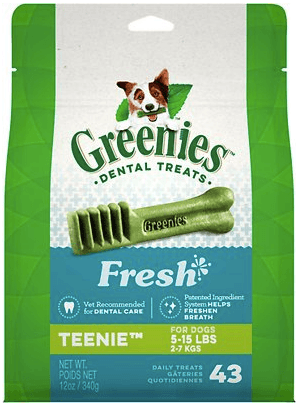 If you’re looking for the best dog treats for bad breath, Greenies has it. You don’t need a prescription for these. Instead, the name comes from being awarded the VOHC Seal of Acceptance for its ability to fight, and control, tartar and plaque. Feeding your dogs these dental chews daily can help fight bad breath-causing tartar and plaque, while also strengthening his teeth and gums. The formula blends highly-soluble proteins with low fat content for the perfect balance for your dog’s nutrition. And, its unique shape helps dogs clean their teeth without even knowing it. Its angles meet each tooth, and between each tooth, for maximum cleaning and protection. Looking for the best dog breath remedy? Welcome to the world of being a dog owner! Bad breath in dogs, much like humans, is cause by bacteria in the mouth, particularly on the tongue and between teeth. So, the best way to cure bad breath in your dog is to brush his teeth! Switching your dog’s food to a dry food with abrasive kibble can also help clean your dog’s teeth and gums between brushing. You can also find dog treats formulated for teeth and gum health that have the same effect. If your dog’s breath still smells bad after switching diets and brushing regularly, there may be an underlying cause, such as respiratory illness or diabetes. Check with your dog’s veterinarian if you have any further concerns about your dog’s breath. Your dog’s teeth and oral health are more important than you may realize. If plaque goes untreated, your dog could be at risk for gum disease, bone disease, infection, and more. Keeping your dog’s teeth brushed regularly is the first step in combating plaque and tartar buildup that causes bad breath and could lead to more serious problems. Your dog’s diet can also help keep his mouth clean and breath fresh! Unique kibble in specially-formulated foods contain extra fiber to act as a gentle abrasive, cleaning your dog’s teeth as he chews. The foods I reviewed are also highly-digestible to help your dog avoid gastrointestinal problems that also can cause bad breath. I urge you to speak with your veterinarian about your dog’s oral health if you suspect that his breath isn’t normal.